TAWOO was founded by Kaoly Asano in January 1997. It was her wish to provide a place for people, who have found each other on a path to Taiko, to discover and experience together the way of Taiko, engage in a variety of activities through Taiko, and by so doing develop their character, charm, talent and energy. The path of Taiko and the path of everyone’s life, reflecting each unique experience, come across and become entwined at TAWOO to further grow into a new and all-embracing path. The beat inside you is the source of your sound. You let yourself go surrounded by the sound of your Taiko and just play, not with your mind, but with your soul. Each and every sound of your Taiko becomes alive and generates groove and harmony. Taiko, its sound, and you become united as one. You express yourself through Taiko. You and your peers, with creativity, stimulate and learn from each other at TAWOO. ‘TAWOO Taiko Dojo’ (TAWOO Taiko School) is a place where anyone can come and play Taiko. TAWOO classes are open to all: kids and grown-ups, old and young, men and women. We also have classes catering to specific group of people: ‘KOTAWOO’ for kids, ‘ELDERS’ for people over the age of 40, and ‘MEN’S’ exclusively for men. All classes are taught directly by the members of GOCOO. We also have a variety of activities surrounding Taiko, such as TAWOORHYTHM (annual recital), performances at local events, workshops, visits to schools and other facilities, lessons for other Taiko groups, publishing, etc. At ‘TAWOO Taiko Dojo,’ no questions are asked about age, experience, or anything else. Our doors are always open to anyone who wants to play Taiko. Taiko will reflect your life experiences, and you will certainly find your own sound when you play. You can sign up for a trial lesson and see if you like it. Please feel free to drop in and play Taiko with us. GOCOO has performed overseas on many tours: Live Tour on Native American Reservations in 2000, European Tour 2003 (Graz, Austria and 6 cities in Germany), European Tour 2004 (11 cities across Germany, Switzerland, Holland, and Austria), European Tour 2005 (24 live performances across Germany, Switzerland, Holland, and Luxemburg). They have also been invited to “Cervantino,” the largest music festival in Latin America and have toured through 8 cities in Mexico. GOCOO sound has also been featured in TV commercials for Hitachi and Toyo Tires. The group continues to expand its scope of activities. 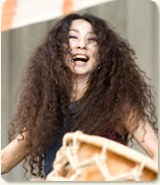 From the ancient times, people sang, danced, and played Taiko in moments of joy and gratitude. 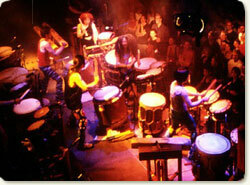 By playing Taiko, they aroused the force and became connected with God and Nature. 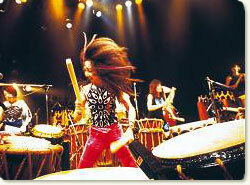 That is the power and the role given to Taiko at its birth. That is the origin of Taiko. We create our sound by being true to this origin and allowing Taiko and its sound to come alive by liberating our senses. Like the blood gushing through our entire body, exhilarating us and awakening our ancient memories, the echo of Taiko arouses our passion. Fusing the sensations of different times with the sound of Taiko, we hope to create music that is truly global and alive today. タヲ -TAWOO- オフィシャルサイト | Powered by Mantra & WordPress.